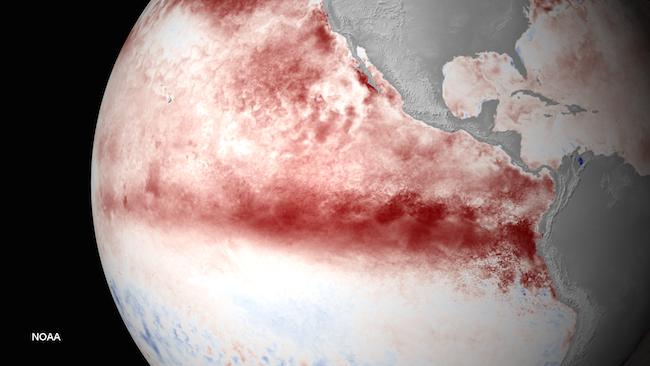 How El Nino Can Impact the Pacific Coastline – Neptune 911! Chad Nelsen wrote the following for the Surfrider Foundation. In recent weeks, the news has been full of stories predicting one of the strongest El Niño’s on record. The last two very strong El Niño events (1982-83 and 1997-98) affected the weather globally and brought strong storms to the California, which resulted in high amounts of rain and snow and big surf along the coast. This extreme weather can have serious consequences on our coasts. El Niño is more formally known as the El Niño Southern Oscillation (ENSO) and is a climate phenomenon triggered by unusually warm temperatures along the equatorial Pacific that affects weather across the globe. The warmer the Pacific Ocean surface temperatures above normal, the more significant forecasters predict the El Niño will be. This August ocean temperatures reached 3.4 degrees F above the average, which is slightly higher than temperatures at this time during the 1997 El Niño, the strongest in recorded history. While heavy rains and storms along the Pacific are often associated with El Niño these outcomes are not a guarantee. Since 1958 there have been seven El Niño systems with three wet ones, three dry and one averages, which is why forecasters keep saying the El Niño only tilts the odds for weather and climate impacts. While the West Coast typically gets stormier, historically El Niño serves up milder winters and reduces the number of hurricanes in the Atlantic. El Niño has global effects and will likely result in another record setting year of global temperatures. There has also been a lot to discussion about whether or not this El Niño will bring enough rain to alleviate the West’s historic drought. While the jury is out on that, it is clear the large storms will bring storm runoff and flooding that will flush pollution to the coast and close beaches. In the Los Angeles region alone it is estimated that a 1 inch rain storm results in over 10 billion gallons of storm water runoff. That’s enough water to supply over 300,000 people with enough water for a year. Urban run off is the number one source of ocean pollution, so not only will much of the water from large storms be wasted, it will pollute the oceans and cause health advisories. The biggest culprit in these issues is the amount of our watersheds we have paved with streets, parking lots, storm channels and any surface that doesn’t absorb water. By using the principles found in our Ocean Friendly Garden’s program on a large scale through efforts called “green infrastructure” – we can not only conserve water but also allow natural areas to act like a sponge and absorb water, which will not only reduce flooding and ocean pollution but will naturally store water for the drier times. The storms and large surf conditions associated with past El Niños has led to severe coastal erosion along the California coastline. While El Niño winters can create a lot of erosion, beaches can actually recover pretty rapidly and the associated heavy rains flush a lot of sediment to the coast that helps naturally replenish beaches. Unfortunately, the short term reaction is to armor the coast with revetments and seawalls. While these structures can provide temporary protection to coastal property, they ultimately lead to the destruction of the public beach and loss of beach access. In many ways, these storms are a foreshadowing of the challenges we face as a result of rising seas. Instead of a rush to shoreline armoring, we need to start adapting to our changing coastlines and plan for a future where El Niño conditions don’t cause major damage along the coast and drive choices, like installing seawalls, that cause long term damage to our beaches. So whether or not this winter brings the “Godzilla” of El Niños, there is no need to wait for the next set of forecasts to begin making changes that will benefit our coasts regardless of the latest weather anomaly. We should start to rethink our water management systems and begin adapting our coastal development for the long term benefit of our beaches, recreation, homes and coastal communities.